Does your relationship leave you confused and upset? Clear the confusion and pinpoint the behaviors that are making you crazy. Then find your way back to sanity! 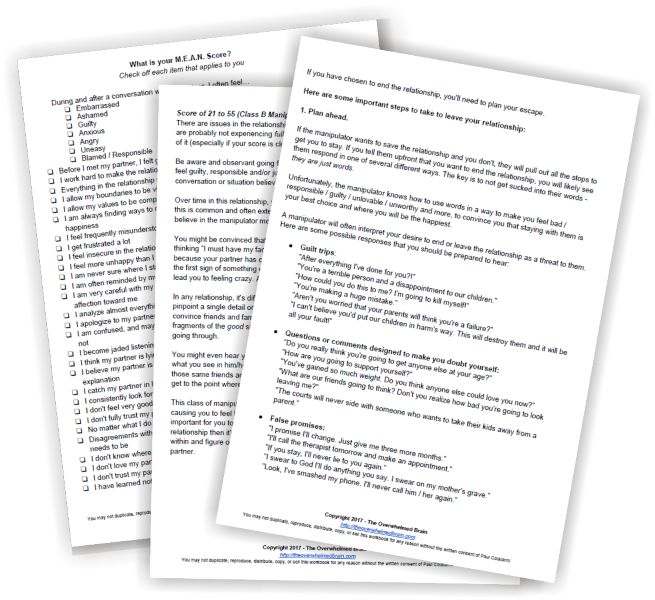 "I just wanted to reach out and thank you for making the M.E.A.N workbook available... I first purchased it about a year and a half ago when I started to very seriously consider that something was wrong with my relationship. The workbook and quiz was so clear cut and concise, that it really left no room for doubt... I'm pretty blown away by how quickly I've healed and how much better my life is"
Thank you. This truly has saved me. Would you know if you were being manipulated or emotionally abused? ...get blamed or made to feel responsible for most, if not all the problems in your relationship? ...feel like you're walking on eggshells? ...pick your words carefully so as not to upset your partner? ...have trouble figuring out what makes your partner happy? ...often wish your partner would validate your thoughts and feelings? ...feel your boundaries being violated? ...hear from your partner that you are the cause for all the problems in the relationship? ...see a much different side of your partner than your family and friends? ...find it difficult to get your emotional needs met by your partner? ...seek empathy from your partner but rarely, if ever get it? ...often get told that you misunderstood what your partner said or that you aren't thinking clearly? ...want to believe that your partner has your best interest in mind (but it never seems to work out in your favor)? If any of these resonate, this workbook will pinpoint exactly how you are being manipulated and / or emotionally abused. If you have not done this type of assessment before, you may be very surprised as you learn more about yourself and your partner than ever. You may also feel liberated to learn that you are not going crazy. …my husband got a score under 20 and my score was in the low 80’s - 4 times higher than his. What an eye opener! Emotional abuse can be so subtle and hard to identify. Quite often friends and family will not see the abuse or manipulation you're experiencing and might even call you crazy for suggesting it. The longer you stay in an emotionally abusive relationship the crazier you will feel. If you are experiencing what you believe to be emotional abuse from a lover, spouse or friend, this workbook is for you. 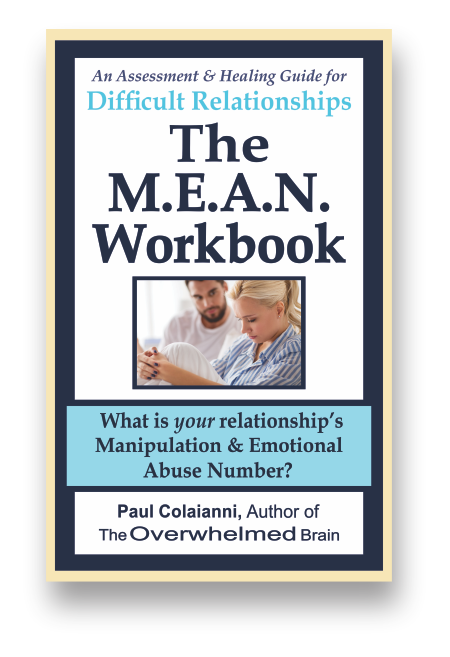 You'll reveal all the abuse through an affirming checklist of signs and symptoms that will help you determine your M.E.A.N. score. This score will tell you just how enmeshed you are in manipulation and emotional abuse. You'll learn exactly what your partner is doing to make you feel so bad all the time. Most victims cannot tell how their partner is abusing them, they just know something isn't right in the relationship. I knew something was wrong. I knew that the way he was treating me, things he was saying to me weren't right and should never be said to anyone. By the time you're done taking the assessment, reading through the material and listening to the insightful interviews with survivors and experts, along with the bonus audios on emotional abuse, you'll not only be able to recognize and ascertain exactly how you are being manipulated, but you'll also have the tools you need to help you with your next steps - whether you choose to stay in the relationship or not. At minimum, you'll understand exactly what is happening in your relationship that keeps it from growing. When you know what's happening, you can communicate more clearly with your partner, family and friends. Get the workbook and determine the where your relationship stands, and whether it's too late to save it or not. If you are unhappy more than you are happy, start the healing journey of increasing self-worth and self-esteem so that you can begin trusting your decisions and instincts again. It's time to emotionally reconnect with yourself and understand what components make up a healthy relationship. I found your workbook concise, pointed and I love that you said the things that need to be said out loud, things I truly needed to hear. Access to a private Facebook peer support group to connect with others that are in a similar situation. You don't have to go through this alone, there are so many other people that understand what you're dealing with. I just took your assessment and got a score of 105... I was surprised to learn that I did a lot of the things on that list to him too.